StemSafe’s extensive range of stemming trucks, services and equipment, combined with 40+ years of industry experience, ensures you receive a safer, smarter, specialised stemming solution to fit your individual drill and blast needs. 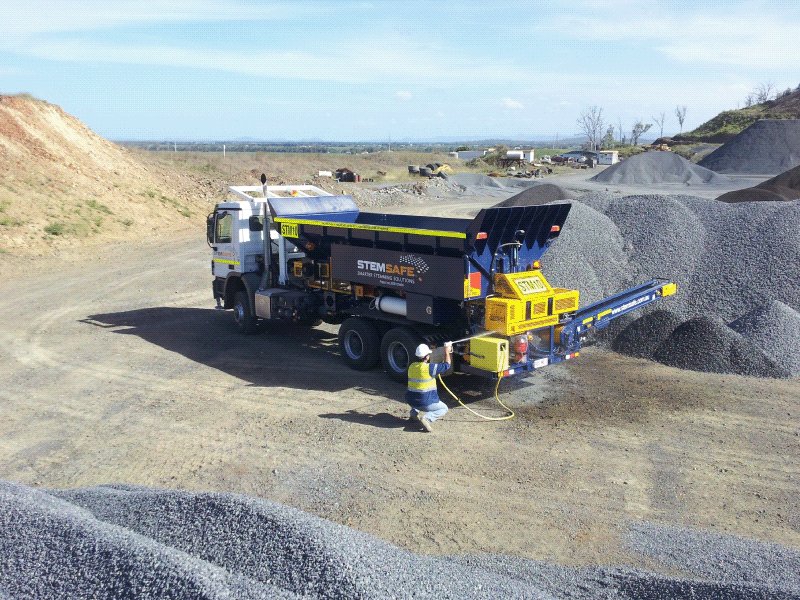 Our service offering ranges from specialised stemming trucks and equipment available for dry/wet hire, equipment sales complete with ongoing maintenance and support, to training and assessment and risk and cost benefit analysis, as well as digitising data collection of the blast preparation processes. Our team are fully qualified to engineer the safer, smarter stemming and blast preparation solution just for you. Our team are practiced in ensuring that our stemming service reduces safety hazards, such as flyrock and overpressure, and we also use a specialised backfilling process that is highly effective at protecting the coal seams and/or ore bodies from blast damage. StemSafe’s patented trucks feature a dust suppression sprinkler system to reduce dangerous exposure to silica and other dust hazards, such as Coal Worker Pneumoconiosis (CWP) and more. Our stemming/water dual purpose trucks offer a unique solution in one time and cost effective mobile unit. This equipment can provide utilisation efficiencies by covering both water truck or stemming truck requirements in unscheduled maintenance events and loading two products at the same location. StemSafe supply stemming and blast preparation equipment with or without specialised operator/maintainer/blast crew, as and when you need it. We manufacture custom-built site-specific blast preparation equipment and trucks for the drill and blast industry. All equipment manufactured for sale includes patented safety and efficiency features as standard. StemSafe can provide a complete end to end service for mine owners and blasting service contractors by taking ownership of the stemming/backfilling blast preparation process. We can provide expert personnel and specialised equipment, the bench preparation, blast pattern signing/barricading, blast hole measuring data recording, blast hole condition identification, accurate and safe backfilling and deck placement to start loading the shot confident of blast hole integrity. We also provide LV hire for blast preparation personnel as required. We provide fit-for-purpose stemming loaders with attachments, as well as dewater pump hire. Loaders can be used as a contingency for major breakdowns/scheduled maintenance events. as well as campaign loading in addition to stemming trucks in peak times. StemSafe can source, coordinate, QA (to client’s specification), maintain and manage on-site stockpiles, reconcile usage and pre-order stemming/backfill material – ensuring that material is always present and of good quality. For clients who prefer to dry hire equipment (without a trained operator), StemSafe can deliver training packages to personnel on your site. Draw from our team’s experience and knowledge of the Drill and Blast Industry with a risk and cost benefit analysis for your site. These studies are based on our client’s site-specific conditions and challenges that show the real benefits for their individual operations. This assists our existing and potential clients in making informed decisions, when the data to show justification for the implementation of StemSafe services to their site. This study can be done via an onsite visit by our experienced personnel or a desktop analysis, with the client providing all information and data required by way of a questionnaire to be populated to generate the report findings. This service and ongoing monthly reporting is included in any wet hire or blast prep crew hire arrangement that StemSafe provides. To enquire or for more information, contact the StemSafe team to customise a stemming and blast preparation solution to suit your individual needs.